BumbleKing Comics • View topic - Sonic Runners: Sticks drops in to say "Sayonara BumbleKing!" Re: Sonic Runners: with Amy, Metal, and more! Y'know, I just started playing this again. I reinstalled it. I get on. Log on to,my G+ account. Doesn't. Remember. Me. I know it's out there, but anyone know how I get it back? Location: Where the party is at. So... I was supposedly supposed to get 100 red star rings and King Boom Boo from the event for placing between 5000 to 8000 place. And I didn't get anything at all! There goes two more spins on the aforementioned wheel of hopelessness. Anyone else have this happen??? I hope that the game will make up for it... I wasted a solid 2 hours on that event. Anybody else find the King Boom Boo companion disappointing compared to the others? The regular Boo seems more useful, especially if combined with the Dark Chaos Chao. Arkus0 wrote: Anybody else find the King Boom Boo companion disappointing compared to the others? The regular Boo seems more useful, especially if combined with the Dark Chaos Chao. Honestly, I find them both to be pretty useless overall (not the Dark Chaos Chao. I really want all the Chaos Chao). To situational. 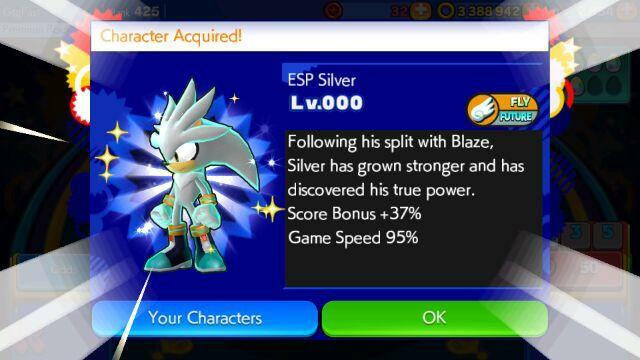 -We now have ESP Silver, who's part of Team Future, which gives a 37% score bonus while having a 5% speed decrease. And yes, this one is Fly type. And references Sonic '06. -Gothic Amy is finally out, she replaces regular Amy as the facebook invite unlock. -Now all the regular characters are on the roulette permanently. Good...or it should have been. -Everything else has been nerfed to the ground. Character bonuses, buddy effects, the time to fight Eggman's boss battle, the fact there are now death traps in the levels that will kill you unless you have protection items...the only thing not nerfed are the points needed to progrrss to each next stage, that's gone up to 19 million points. I'm currently begging my facebook to help me get the Gothic Amy (hearty laughter). so which ones count as "regular characters" for the roulette now? I'm gonna take a wild stab that the Halloween characters and Amitie Amy aren't in there, but are Classic Sonic and Tikal? and does ESP Silver count as "regular?" Last edited by Mr.Unsmiley on Fri Nov 27, 2015 12:54 pm, edited 1 time in total. Re: Sonic Runners: Amy is GOTH, not emo! edit - actually, it sounds like he's someone who actually works on the game rather than a dataminer. he refers to it as a "dev post" and has it filed under "game development art"
I would say something about Mephiles being a cool addition. If the gameplay didn't nosedive to oblivion. The frame rate got nerfed to heck and I almost always die from the frame rate and rarely from actual human error, and those sucker punch guaranteed death traps? Don't get me started. Also, what was wrong with the item based gameplay? Who had a problem with this? Character and buddy bonuses have been nerfed to death, which consequentially means that any new or interesting buddy or character is basically worthless and leaves no sense of satisfaction because my score will be the same no matter who I choose, which is not okay. It was really fun to optimize my party for the best score possible, but now it doesn't matter. The ability to get any character at any time is also a step backward. Sure. I COULD get Shadow at any time. but more likely I'll get a dozen characters I don't care about first. Not that getting new characters even matters now because all bonuses and items are complete trash. I feel like they tried to make it more like Dash where the main goal was changed from never dashing to dashing as much as possible. That doesn't work nearly as well in this game which I used to praise for it's huge variety of bonuses and variety. Finally, the executioner axe in this poor, massacred game: They slowed it down. It's not fast enough. Not that it matters because the fram rate will kill me even on this slowed down speed. Ugh. Why Sega? Why!? You've broken so much more than you've fixed! I can barely even play the game anymore! I haven't noticed the game being slower. Then again, it was slowed down between the CA/JP and worldwide released, so maybe I can't notice it anymore? I'm not opposed to having a shot at the unlockable characters. They've had two runs of limited releases, and missing those windows was frustrating, so having a regular shot at them is nice. I am iffy on repeat characters stacking, though. Does this level them up? Does it build up their buffs? I haven't seen a clear explanation of what's going on with them now. There's an added stat called the star rank, and that's what levels up if you get a character again in the roulette. What does it do? People aren't sure yet.